Inspired by the sea buckthorn growing against the odds on the wind-blown, sea-sprayed dunes of Gwithian – infusing sea buckthorn berries creates a distinctively wild and refined tonic. 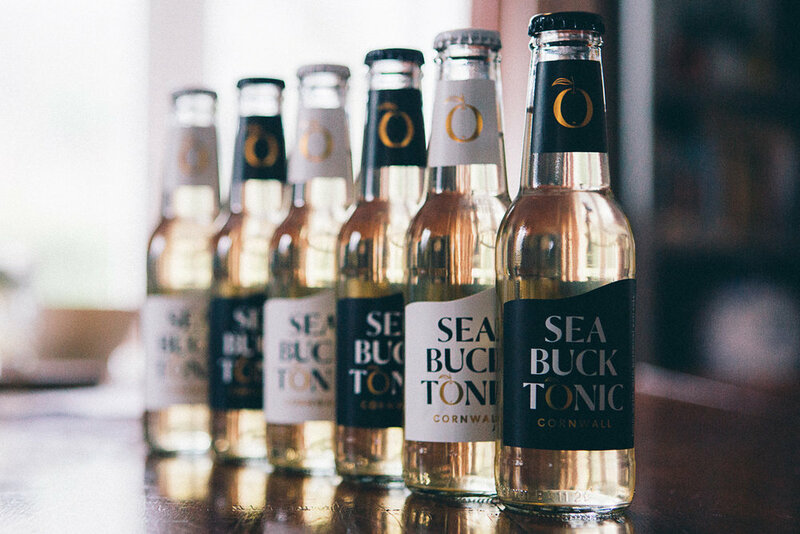 The carbonated spring water in Sea Buck Tonic is collected straight from its source on the moors of the Cornwall peninsula. It’s full of minerals and tastes clean and alive. Sea Buck is golden in colour due to the quinine is extracted naturally from cinchona bark. Since the trees aren’t transparent, neither is the tonic. Sea Buck’s signature taste comes from the sea buckthorn berries. Tiny, vividly orange and full of powerful nutrients – these berries have an intense citrusy flavour. They also happen to be the super-food responsible for astronaut health, Genghis Kahn’s battle success and the flight of Pegasus. But those are other stories. "The final touch to your summer G&T." The world of gin is eclectic, creative and diverse. But as Charlie and Pablo used their expertise to match fruits, spices and garnishes to specialist spirits, they couldn’t help thinking that the tonics were letting the side down. Over the course of a year, they unravelled the secrets and stories of tonic water between bar services, interrogating the process and discovering what a real tonic should be. Now branded locally and packaged sustainably, Sea Buck is flying off shelves everywhere. Pablo and Charlie talk about passion, precision and real tonic. Charlie: That’s right. And there isn’t a tonic that matches the quality of the gins. We wanted to make that aesthetic experience even better by improving a gin lover’s drink. Pablo: When we started there were so many awful ones! Charlie: It was a long process. Pablo: But, after a lot of messing about, I tried the sea-berries. A chef friend showed me sea buckthorn ages ago when he was making a liqueur and there was something about it that stayed with me. Straight away I knew we’d cracked it. Charlie: It’s special and it’s different. We just had to do it. We ran taste tests, blind tests and everyone loves it. It’s just flowing. But now we’re passionate that it has to be precisely Pablo’s mix. Pablo: Yes, it has to be the one. We’re not just going to put anything out there. Charlie: It’s about giving people another option for their gin, something that is better. Sign up to receive Sea Buck stories, news and events updates.